Seph does excellent work...he is extremely conscientious always on time, and communicates well concerning our pest control needs. Always on time Always thorough Always effective! We used hearts for 10 years. They’ve never let us down. Once we connected over the phone, Hearts sent someone out just a day or two later and they showed up right on time. Seff handled our service and not only worked tirelessly ensuring that the many spider webs that had accumulated (and all of the other creepy crawlies) were dealt with, but he also took the time to explain how it all works and offered very sound advice. We will definitely be continuing with our monthly service - thank you! We have been very happy with their service. Their office has been very helpful and accommodating whenever I need their assistance. There was a mixup for my first visit and Hearts was apologetic and accomodating to rectify the mixup. Polite technician and customer service reps. So far very satisfied! The way a business should be. Seff was very informative and helpful! It’s great to be back with Hearts. John was smart and efficient. I’m very happy with the services from your company. Very professional and efficient visit. I will be using their services again. On time, very welling to pleasr. I am happy with your company but haven’t caught any rats 🐀. I have to find someway to get rid of the rats but would like to keep your company for future services. The rats 🐀 are too smart for traps. I have been very happy with the results of my service. They were honest on what I needed to do for my camellias before any spraying could be done. Very nice and informative man that came out. Great informative service! Thank you! No problems. No need to change company. I am sure the insects and spiders that I no longer see would have a different view. The staff is very knowledgeable and courteous. And our spider and ant problems are GONE! . Highly recommend their service. Very happy with the customer service! Very polite technician and prompt service. Highly recommend. works great! great response to additional sightings~. Great service, love Seff - his knowledge and his kindness. I really appreciate the technician's knowledge about all kinds of pests, and his patience with my questions and concerns. John was very professional and explained the benefits of the pest control treatment he used today. Would recommend Heart Pest Management to my neighbors. John arrived ready to help and checked in first to see if we had anything new to address. Very helpful! professional and friendly and effective - I don't have to worry about it. Super positive. John was fantastic and I really appreciated his customer service. Have used Hearts for several years and very pleased. Seemed good to me. We will see what the bugs think of it. 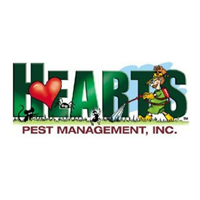 Highly recommend Hearts Pest Management. Great service without all the toxic chemicals! Professional, on time, helpful, efficient and honest.